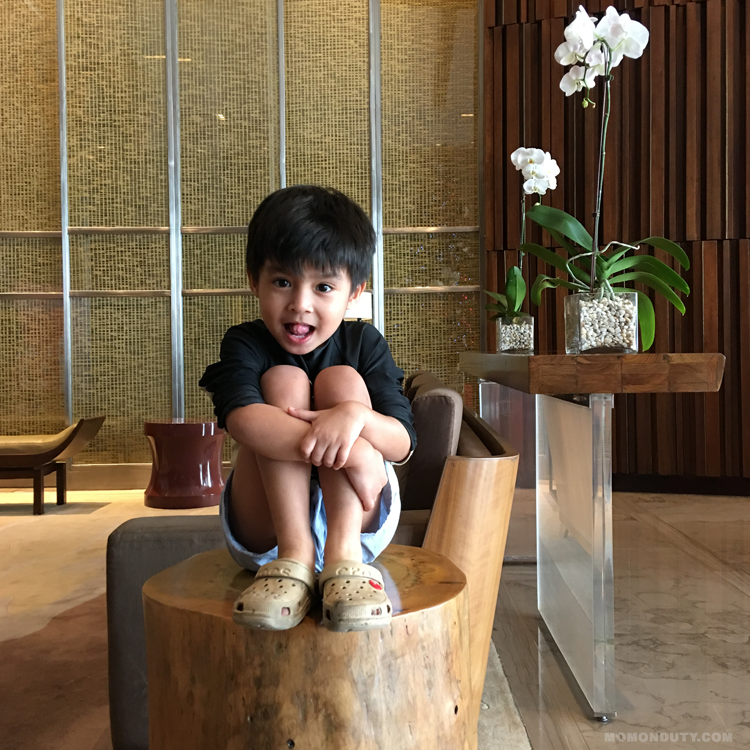 Last weekend, Marco Polo Ortigas, Forbes Travel Guide 2017 Five Star award winner, invited my family and I to a luxurious staycation perfect for families looking for a weekend of relaxation and bonding. As you may have noticed, our family loves staycations. 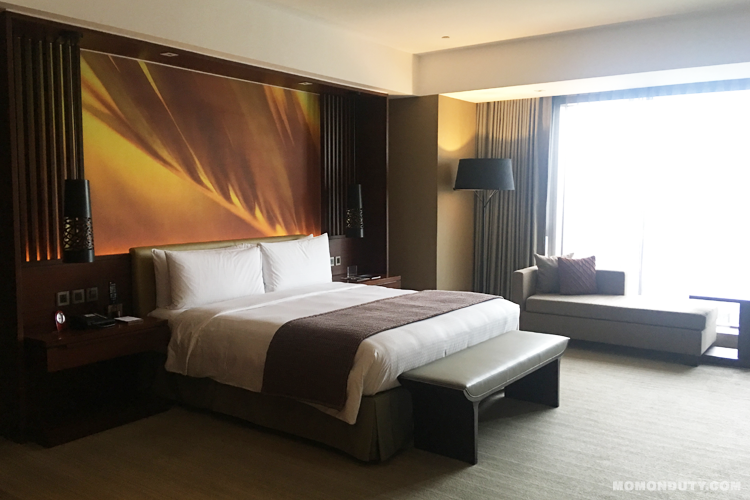 We’ve heard so many good things about Marco Polo Ortigas – plus November is my husband’s birthday month and we didn’t get to celebrate his birthday since he was deployed for the ASEAN Summit, so the staycation couldn’t have come at a better time. We arrived at the hotel just before check in time. The minis were getting bit fussy while we waited for our turn because it was a long a day for them already so it’s good that the lobby is very comfortable (with comfy seats for those who are waiting). Guests who are waiting to be checked in are also served refreshments. There was a line upon our arrival, but it was managed pretty quickly by the receptionists. There was a bit of a mix up with our booking, but the receptionist who handled us was very helpful and patient in answering our questions and requests–something we truly appreciate. Two thumbs up for that! 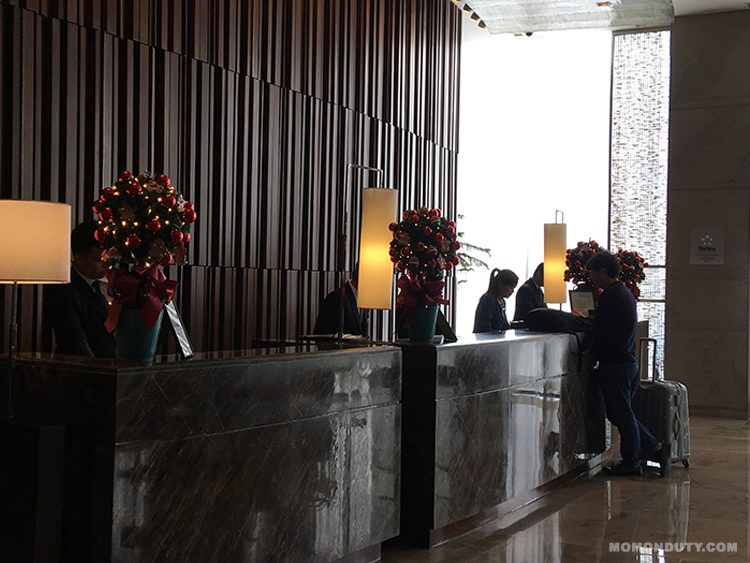 You will already feel the holiday spirit upon entering. The minis were most fascinated by the tall Christmas tree surrounded by gifts and actual ginger bread houses! Once our room was ready, we headed straight up to have some rest. We stayed in a Premier Room, which is a spacious corner room that gives guests a beautiful view of the city. 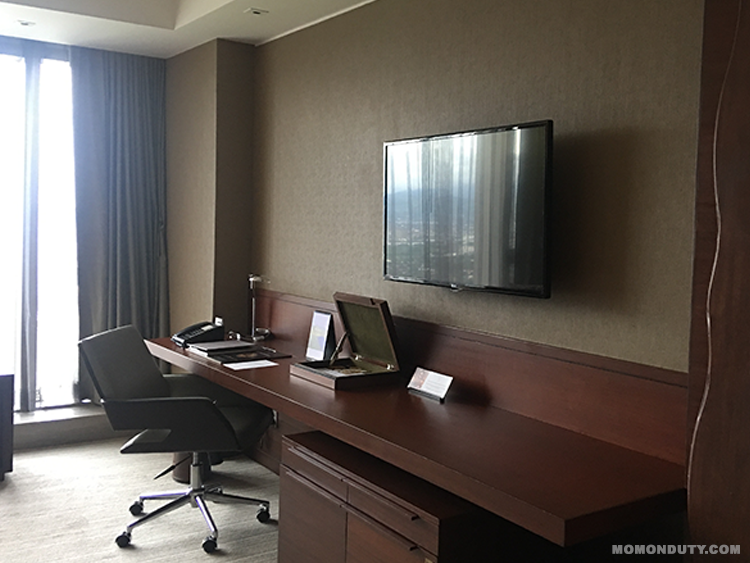 Each Premier Room has a king-sized bed, an executive desk (perfect for people like me who bring work everywhere! 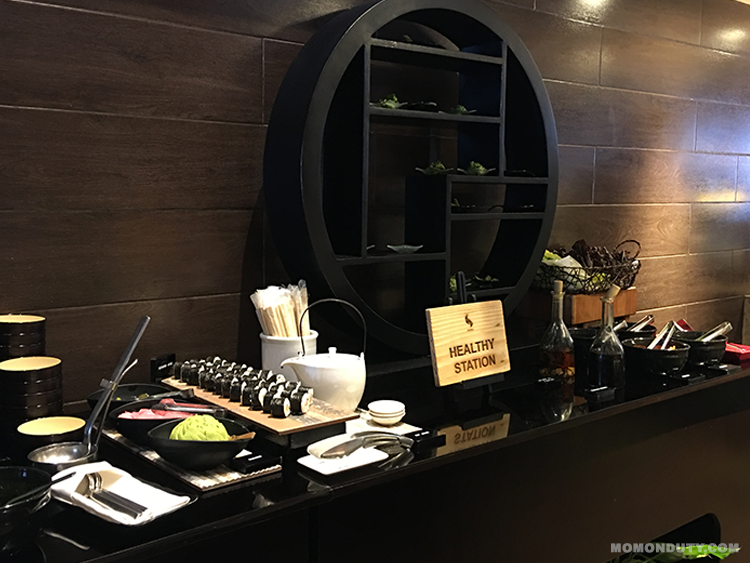 ), internet access, a mini bar and refrigerator, and a coffee/tea corner with a Nespresso coffee machine, which was my husband’s favorite during our stay! 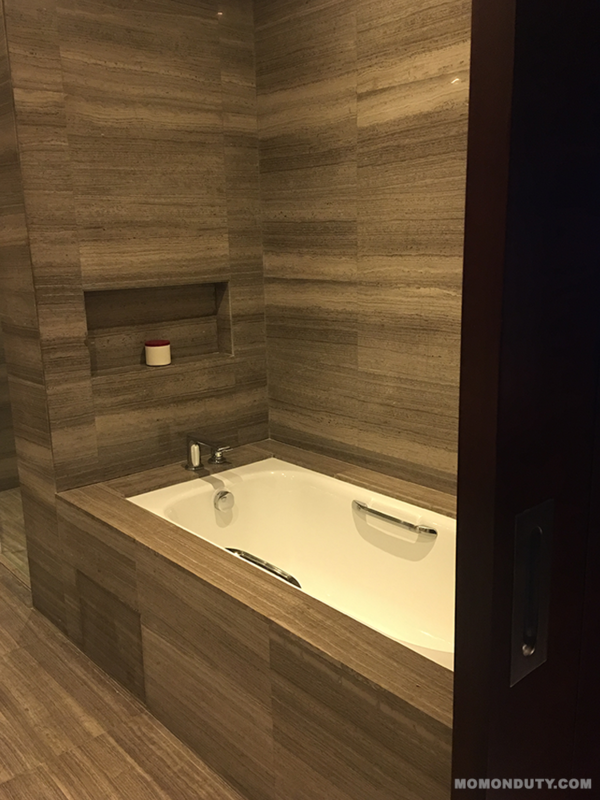 Of course, the room comes with a bathroom complete with a marble bath tub (a must when we check into hotels! ), rain shower (every hotel needs to have this! ), his and hers sinks, and a separate toilet. I love that they’re very generous with the toiletries too–which don’t come in small sachets, but in tubes enough to last your whole stay. Not too long into our stay, we were visited by Marco Polo staff, James, Katrina, and Louie, who brought a cake and balloons as a birthday surprise for my husband. Guys, the cake isn’t just a teenie tiny cake – it’s a full-sized one! We really appreciate the extra effort, Marco Polo Ortigas!!! 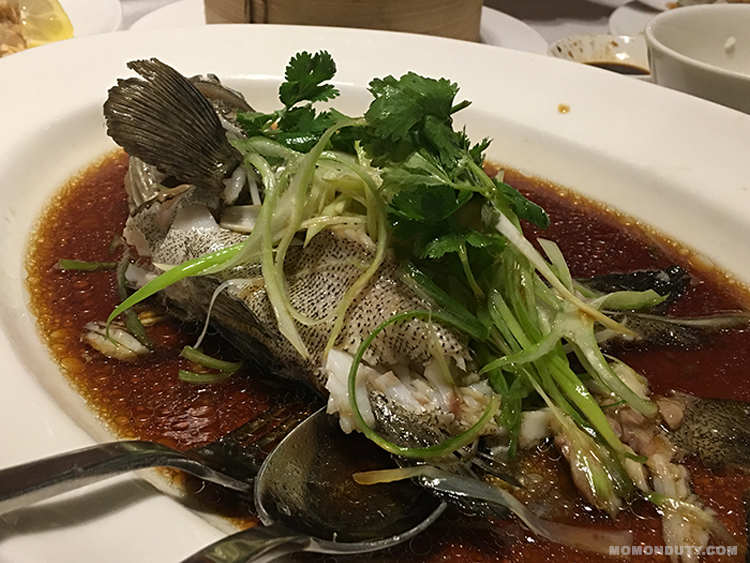 Come dinner time, we went to Lung Hin, Marco Polo Ortigas’s contemporary specialty restaurant that features authentic Cantonese cuisine. As much as I’d like to order my favorites, we got “kid-friendly” dishes since the minis were with us. 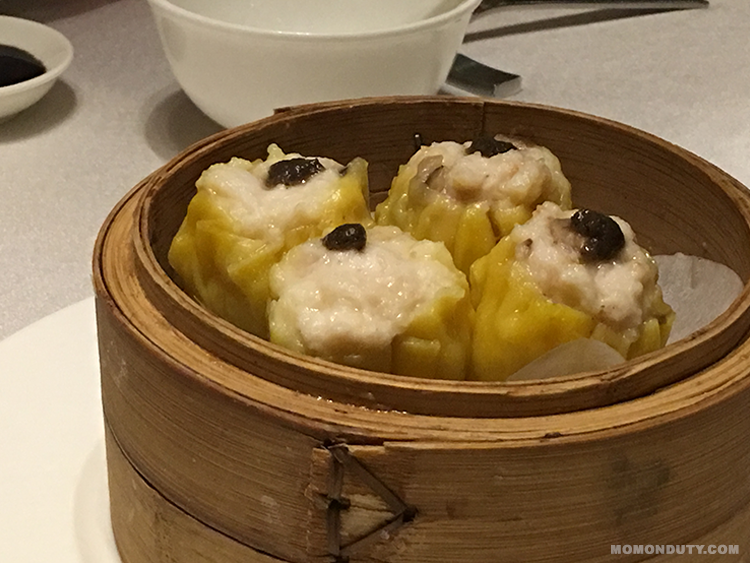 For appetizer, we ordered the minis’ favorite, Steamed Pork Siomai. 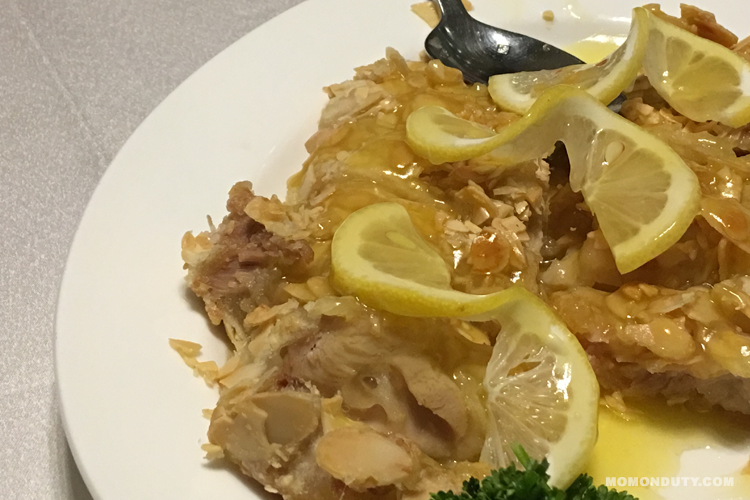 For our main dishes, we got their Hong Kong Style Crispy Fried Chicken with Lemon Sauce and Steamed Fish in Soy Sauce paired with Yang Chow Fried Rice. My husband also tried Marco Polo’s Signature Earl Grape Iced Tea. I would have loved to have a glass of that as well, but my doctor advised me to go for water instead of flavored drinks. Next time!!! 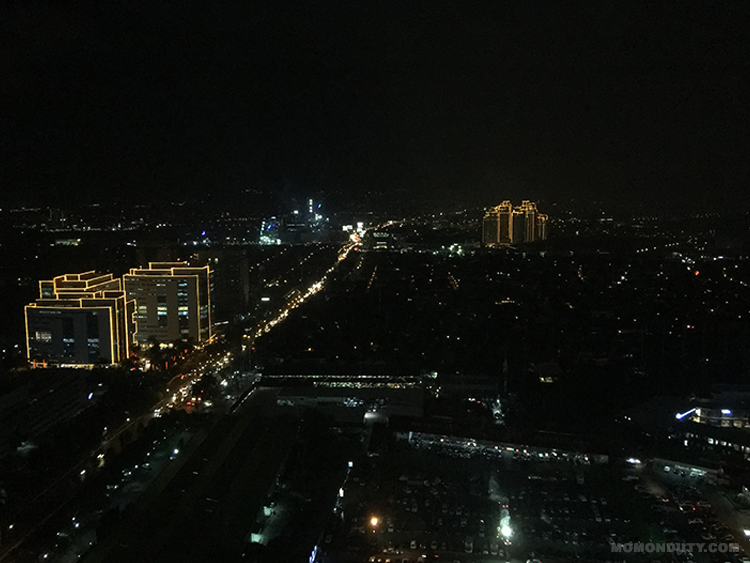 We were planning to have dessert at either Cafe Pronto or try the British dishes offered at Vu’s Sky Bar and Lounge as part of the Great Brit Fest, but we felt full after our dinner feast so we decided to just call it a night. Besides, we still had a huge cake waiting in our room, which the minis gladly ate. The next morning, I was up extra early–like 4 AM early (thanks to the baby in the tummy who woke me up with strong kicks). Since the whole family was still asleep, I found myself a spot on the couch and enjoyed the view of the city from our room. Thankfully, my husband and the minis woke up early. 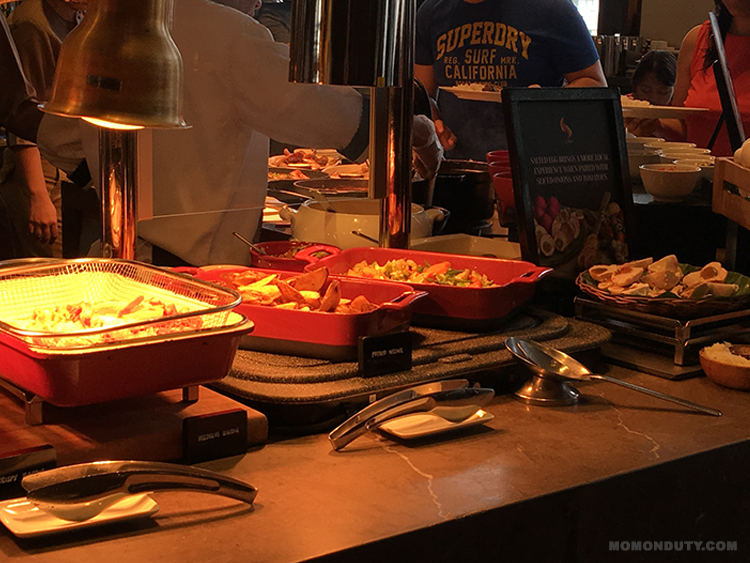 Come breakfast time, we all went down to Cucina for the buffet breakfast. The minis went straight for the cereals while my husband and I opted for the Filipino breakfast selection. There are, of course, other stations where you can find different food selections. 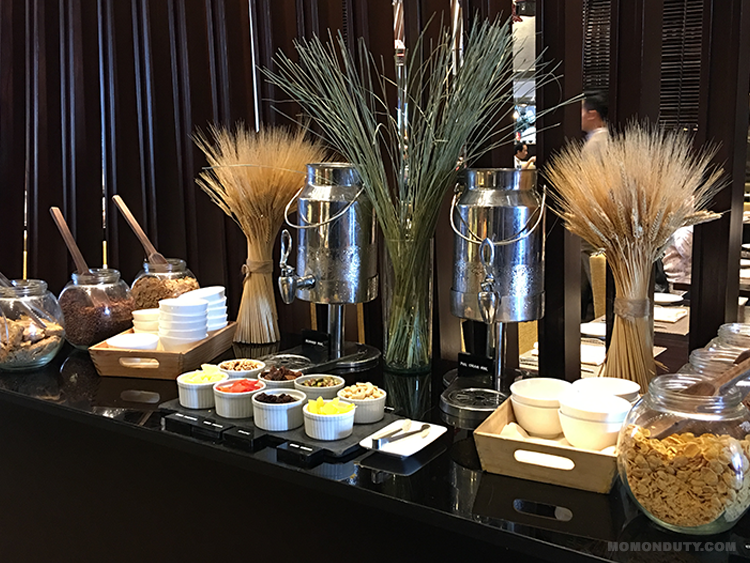 The buffet breakfast is complimentary for checked in guests. Kids aged 6 years old and below eat free! 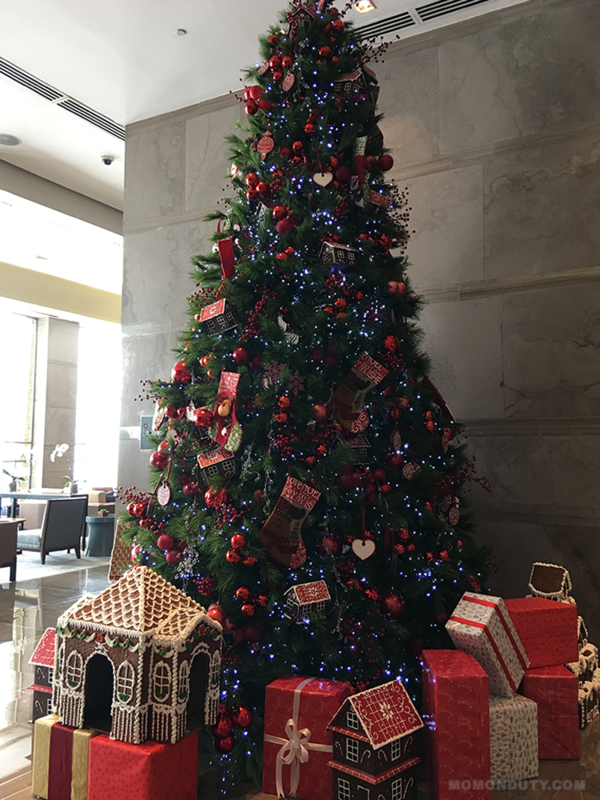 If you’re still looking for a place to celebrate Christmas, head over to Cucina to treat your family to a lavish and savoury feast with all-time favourite classics–festive roasts, decadent desserts, and more–that are perfect for this holiday season. What can you expect? A team of expert chefs led by Chef Alistair Bletcher will prepare a sumptuous Christmas Eve spread featuring an array of festive dishes such as Assorted Seafood Tempura with Dipping Sauce, Crispy Skin Duck Breast on Mango Basil Sauce, and Slow-braised Lamb Shoulder with Redcurrants and Tarragon. Partake of festive roasts of Roasted Turkey, Roasted Angus Beef, and Caramelised Spiced Honey Ham. On Christmas Day, delight in the sumptuous signature dishes such as Fillet of Pork Mushrooms, Spinach, Lemon and Grain Mustard Sauce, Lancashire Hot Pot, and Salmon Cakes with Caper and Dill Mayonnaise. 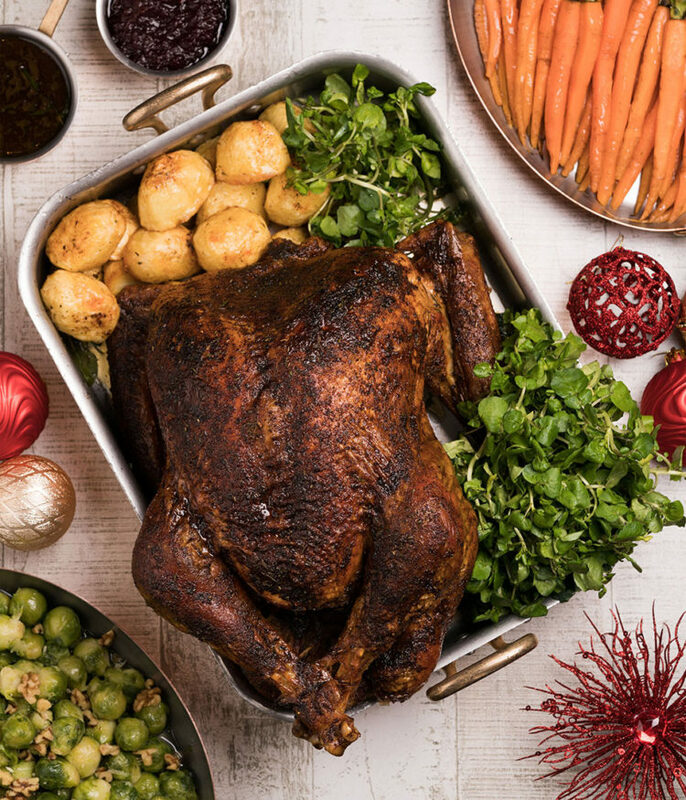 You can also indulge in the carvery station with Roasted Christmas Turkey with Stuffing, Chipolatas, Cranberry Sauce and Rosemary Jus, Twice-Cooked Crispy Pork Belly, and Caramelised Honey Ham. For New Year’s Eve, relish into an indulgent New Year’s Eve celebration with a spread of piquant dishes like Medallion of Beef with Parmesan, Onion Crust, and Red Wine Jus; Leek, Potato, and Gruyere Cheese Cannelloni on Cepe Cream, with Roasted Shimeji Mushrooms; and, Seafood Thermidor Pots. Feast on Iberico Pork Loin with Apple Sauce, Roasted Angus Prime Beef Rib with Yorkshire Pudding, Red Wine Jus and Horseradish Sauce, and Chinese Barbecue Duck. Transport into a culinary journey for your New Year’s Day Celebration with Spinach, Ricotta, and Fontina Cheese Cannelloni with Roma Tomato Sauce and Marinated Grilled Artichoke Hearts; Slow Braised Angus Beef Short Ribs in Green Peppercorn and Tarragon Cream; and, Fillet of Red Snapper with Hot and Sour Green Papaya and Tamarind Chili Sauce. Plus relish on the Roasted Sirloin Beef with Yorkshire Pudding and Red Wine Jus, and Roasted Leg of Pork. After breakfast, we took the minis to the pool for a dip. The indoor pool is 4 feet deep all the way, but there’s a jacuzzi where smaller kids can hang out. Both have a beautiful view of the city. What we love about the pool area is that it’s complete with amenities. After your dip, head over to the shower rooms where you can wash up and enjoy a few minutes in the sauna. The shower rooms are complete with toiletries, too, which is great so guests can bathe and dress up before going back to their rooms. In the same area is the hotel gym and Flow Spa. Again, I wasn’t able to try these since I’m pregnant, but I will definitely be back once our baby is out! The minis spent most of the morning swimming. They even made new friends during their stay! It’s a good thing we were granted late checkout so we all had time to rest after pool time. 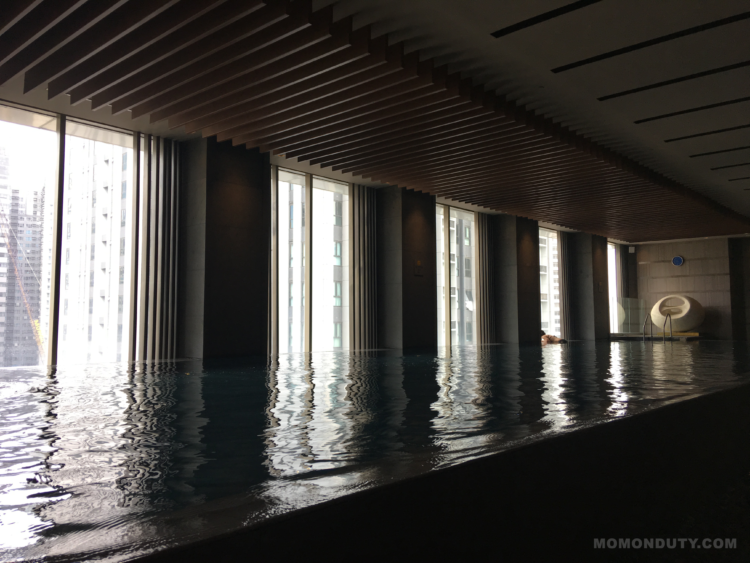 All in all, we had a wonderful time throughout our Marco Polo Ortigas staycation. 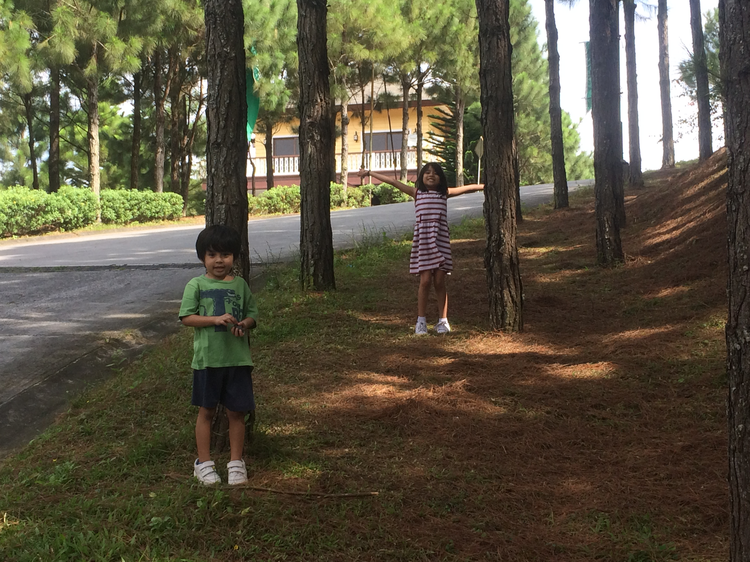 Not only were we able to relax after a busy month, but we were also given a chance to bond as a family without any hassle because everything we need is already in the hotel–a comfortable accommodation, delicious food, and lots of activities we can try. 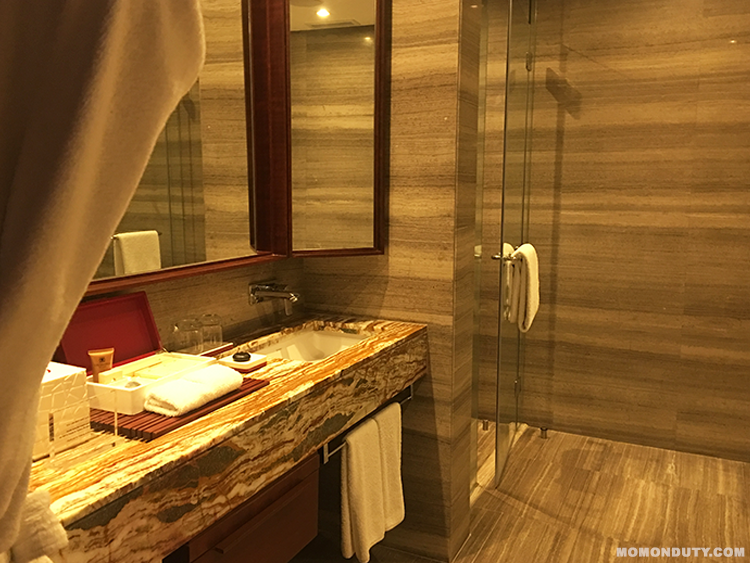 The hotel is also located at the heart of Ortigas Center so it provides easy access in case you want to head to the malls in the area. Listen to the sweet symphony of Christmas carols as you gaze around the halls of the tinsel town. 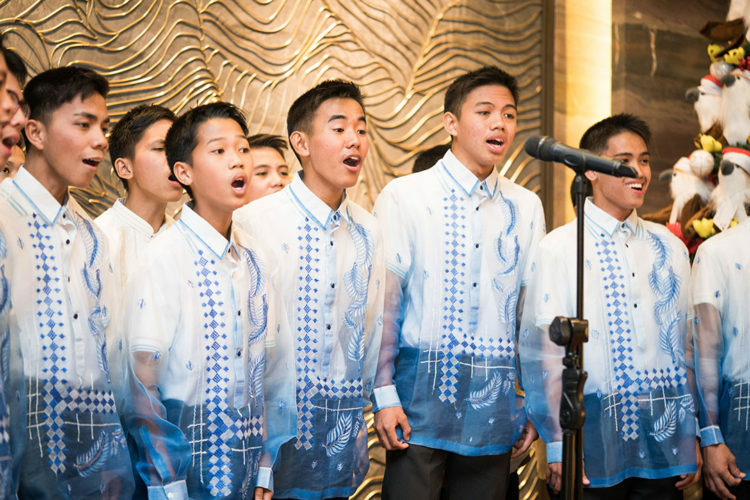 Choirs from different groups are coming in to serenade the guests, and make you feel the holiday light, in all weekends of December. Rudolph’s bell rings for the Sundays of December as Santa Claus comes in his sleigh to get the Christmas wishes, and take snapshots with the nice kids! What are you waiting for? 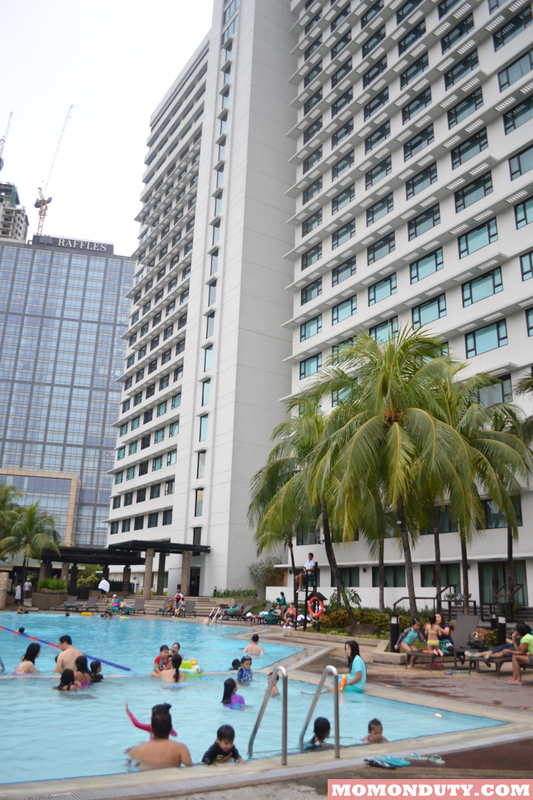 Book your Marco Polo Ortigas staycation and enjoy a memorable holiday with your family!